Last month, Norwegian Cruise Line announced a new all-inclusive program for 2015 in North America, and this month it announced a similar program for the UK. There are some interesting comparisons between the two programs in that fare reductions that are part of the package differ, as do rates of exchange used for different bands. Elsewhere in Norwegian’s “new” realm since agreeing to acquire Prestige Cruises, Kevin Sheehan remarked that Bermuda might see more Prestige ships in future years. And in China, Bohai Cruise has inaugurated its independent cruise service using the 800-berth Chinese Taishan, formerly Costa Voyager. In early August, Norwegian Cruise Line announced a new All-Inclusive add-on program in North America, with a range of a dozen add-on costs (since reduced to three ranges) for the package based on the number of days in the cruise. This more all-inclusive program than its existing drinks packages has now also been introduced in the UK. Interestingly, Time magazine had a look at the subject and on the original trial-price $899 package for a 7-night cruise it calculated that you’d have to drink 137 beers to break even on the package in a week – if all you did was drink beer. That would be 20 beers a day, although the newly revised cost will now be $799 for seven days. In point of fact, the new all-inclusive package includes a lot more than just beer, with specialty restaurant meals, spirits and wines, bottled water, 250 internet minutes, $200 of shore excursions, 20 photos, gratuities and a discount on the cruise fare (10% in North America but only 5% in the UK for some reason). For $799 for a week (£420 in the UK), “heavy consumers” can add these all-inclusive packages to their fares for cruises everywhere except Hawaii, where the alcohol laws are different. The add-on packages are also commissionable to travel agents and in the UK, Norwegian has made a point of telling agents that they can almost double their commissions by selling the all-inclusive package. The illustration used is a £478 Western Mediterranean cruise, on which the all-inclusive package would be £420, or an 88% increase in the amount paid by the client – and an 88% increase in commission. This in turn leads one to do another calculation, as using the same numbers the proportion of on board spend from the overall amount would be £420 out of £898, which comes to almost 47%. It’s interesting to compare this result with Norwegian’s claim that about 25% of its revenues come from on board spend, but of course the fares quoted above are entry level and 47% calculates out as more of a maximum, compared to an average until now of about a third more on board spend than the ticket price. Still, the package will serve to confirm a goodly amount of on board spend before sailing date and with Norwegian already having the money in the bank this will prove a boon to cash flow as well. 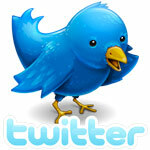 Norwegian estimates that about 20% of its clients will participate in the program. Added to the differing fare discounts on each side of the Atlantic, there is a discrepancy in the rates of echange used. Just why Norwegian should be using differing rates for different packages is hard to fathom. But if you have any doubts, at least the American packages remain fully refundable right up until the day of sailing. In order to avoid problems and disturbances during the traditional American university spring breaks, participating guests must have a minimum age of 25 between March 1 and April 15, 2015, although it’s 21 for the rest of the year. Good news for shareholders we guess. In other news, Sheehan was quoted in Bermuda recently as having said that with its acquisition of Prestige Cruises the “new” Norwegian group might take a bigger interest in the now underused Bermuda ports of Hamilton and St George’s. The maximum length of ship allowed in Hamilton is about 720 feet, on 26 feet of draft, and similar limitations apply at St George’s. The great advantage to Hamilton of course is that ships dock right on the city’s main thoroughfare of Front Street. Both Regent and Oceania have been to Bermuda in the past and indeed in 2003 Regent (then Radisson) ran the 560-foot 490-berth Seven Seas Navigator on eleven weekly cruises from New York and Norfolk to Hamilton and St George’s. 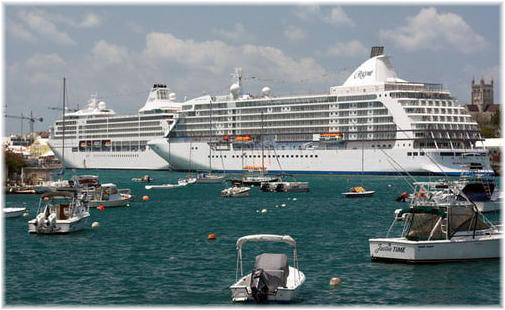 Oceania, on the other hand, has put the odd sailing into Bermuda, usually on positioning voyages or seasonal cruises. At 594 feet, Oceania’s 684-berth “R” class ships Insignia, Nautica and Regatta can get into Hamilton and St George’s, but because of their length, the 776-feet 1,250-berth Marina and Riviera are restricted to Bermuda’s outlying Naval Dockyard. The “R” ships are only slightly longer than the Furness Bermuda Line’s 580-foot Queen of Bermuda and Monarch of Bermuda, which at one time were the mainstay of the New York-Hamilton trade. Of the three Regent ships, not only the Seven Seas Navigator but also the 709-foot Seven Seas Mariner and 677-foot Seven Seas Voyager, both with 708 berths, have docked on Front Street in the past. Indeed the Mariner and the Voyager became the two largest ships to do so when they docked together in Hamilton in April 2008. At 732 feet, the 738-berth newbuilding Seven Seas Explorer, due in 2016, will be subject to approval by the local authorities as to whether she will be able to berth in Hamilton. That means that five or six out of the eight existing Prestige ships could be candidates for Bermuda. Between 2010 and 2012, in which year she made 19 voyages, Holland America Line ran its 719-foot 1,348-berth Veendam between New York and Hamilton, but she did not call at St George’s. After not being able to make enough money sailing to Bermuda, Holland America switched the Veendam to the Boston to St Lawrence trade at the end of 2012. 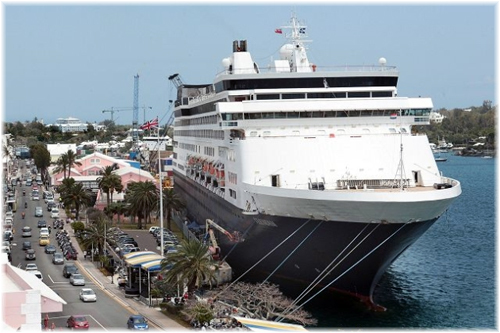 However, with ships’ casinos now allowed to open in port, Veendam will test the water again in 2015, making six sailings between Boston and Hamilton between May and July, alternating with her Boston sailings to the St Lawrence. The end of August saw the inauguration of regular cruise service by Bohai Sea Cruises Ltd, when its Panamanian-registered 800-berth Chinese Taishan left Yantai for her first regular 5-day cruise to the South Korean ports of Incheon and Jeju. By summer she will trade to Korea and by winter further south to Taiwan and the South China Sea, probably from Shanghai. Bohai Sea Cruises executives announced that their new ship had been acquired fro the world’s largest cruise group, Carnival Corp & plc, but at the same time said that the line would be an independently-operated Chinese enterprise, and not associated with any of the big three cruise groups, Carnival, Royal Caribbean and Norwegian’s major shareholder Star Cruises. The vessel herself is the former Costa Voyager, the smallest ship in the Costa fleet when they disposed of her. Built for Royal Olympic Cruises in 2004 as Olympic Voyager, the Chinese Taishan’s twin sister Explorer is now owned by the University of Virginia and used in its Semester at Sea program. She is managed by V.Ships of Monaco. 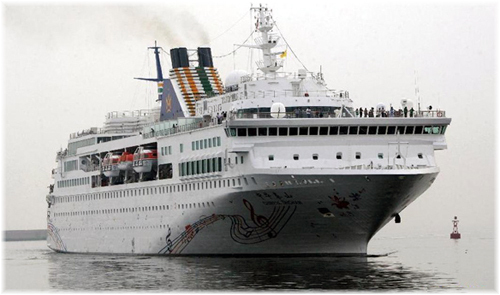 Bohai Sea Cruises has strong back-up as a subsidiary of the publicly traded Bohai Ferry Co Ltd, which operates nine modern ropax ferries between Yantai and Dalian in the Bohai Sea, and whose stock is recommended as a buy at the moment. Bohai Ferry also offers round trip mini-cruises on its ferry fleet. Based in Hong Kong, Bohai Sea Cruises has said that it would be interested in acquiring further existing cruise ships as it grew its business. Yantai, formerly know as Chi-Fou, has a population of about seven million and lies at the juncture of the Bohai Sea and the Yellow Sea across from Korea and Japan. With a moderate climate, it is known for its apples and wine and borders the city of Qingdao, 145 miles to the southwest.